Would we be lucky if benevolent aliens owned the Earth? Astronomers have detected over 20 potentially habitable exoplanets as of February 2015 and the number will probably double by the end of the year. Seven are less than 25 light years. See the Habitable Exoplanets Catalog. If our galaxy is teeming with life and probably intelligent life, from the estimated 40 billion habitable planets in it, why are we not being contacted by aliens? Civilizations just a few hundred years ahead of us, might already have found a way around the light barrier problem without having to break the laws of physics. Why aren't they stopping at our system, then? Even with a hyperdrive, interstellar travel might have its limitations. If a light year could be traveled in one week, it would still take over a thousand years to traverse our galaxy. Perhaps they are very far away or as this post explores, already here. The idea that there's plenty of intelligent life around us that we are unaware of, makes sense. Our planet is interconnected and just hours-wide, still there are many uncontacted tribes in the Amazon, New Guinea and other places. Does this phenomenon scale up to the stars? Are we an uncontacted tribe looking for smoke signals in space? For a galactic civilization, light-speed communications would be very slow. It is possible that they aren't using radio signals but an ultra-advanced interstellar internet that perhaps is all around us and that we are unable to tune into. But wait, if we are an uncontacted tribe, are the tree-cutting tractors getting closer? Hopefully, the science of interstellar travel, ultimately, takes civilizations to a state of technological post-scarcity, to a place where the exponential exploitation of resources and war become unnecessary. For these societies we might be of no interest other than for observation. They would gain nothing from contact but risk a lot (See: Contact: First Befriend the Poweful ) On the other hand conflict could very well be present in the darkness of space. Are we eons away from discovering faster-than-light travel? Does it require super advanced physics that we will only be able to master once we become a type II or type III civilization or are we approaching a tipping point that will make it something like the discovery of nuclear fission? If the second were true, there could be alien Einsteins out there discovering its equation in the middle of a state of uncertainty and global conflict. Will we, unfortunately, get to know these type of civilizations first? Thinking optimistically, no, if we are in the middle of the galactic country of an ethical or post-scarcity civilization and this could be the answer to the silence we perceive, to the Fermi paradox. It is called the ownership hypotheses. 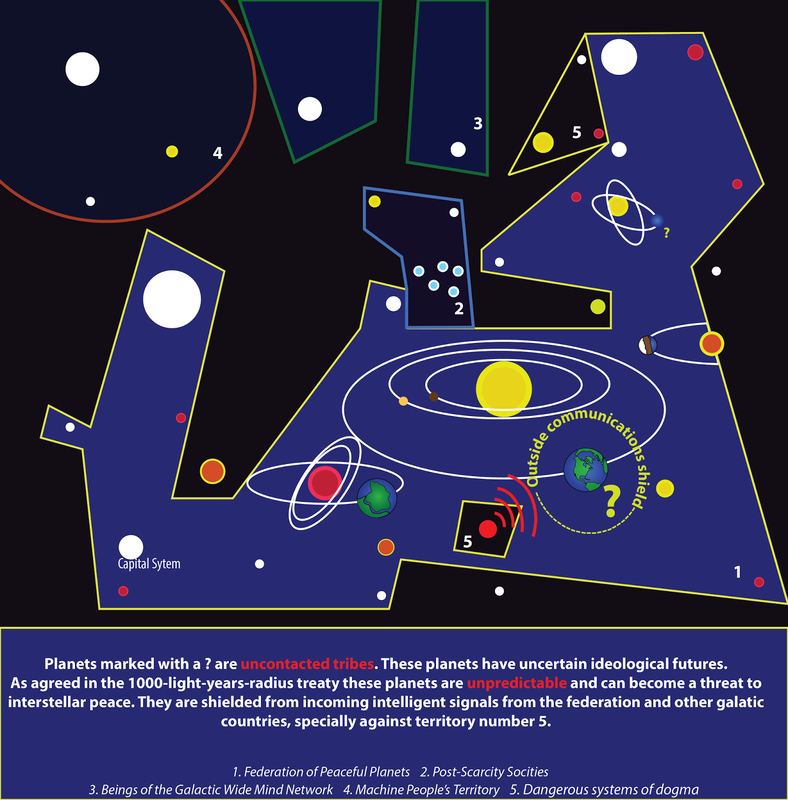 Considering the cultural and ideological differences that could exist between intelligent life evolving in very different planetary ecosystems, it seems unlikely that every FTL-capable civilization would agree upon the same course of action, you know: the prime directive, that prohibits extraterrestrials from interfering with the internal development of an alien civilization. Therefore, there might be One civilization guarding our planet against unwanted alien messages. How could they claim that they have the right to decide who talks to us? By saying contact with Earth is a threat to their safety or sovereignty. If we are in the middle of the stars they inhabit we might technically be in their country or sovereign territory as it happens on Earth with the uncontacted tribes. Or, if life came to Earth by panspermia from the source that also seeded their planet, they could argue we are a part of their evolutionary tree of life, a part of them, a natural and cultural heritage of theirs that should be left undisturbed. If they came here and didn't share with us how their ships work (wouldn't that be one of the first things we'd ask?) we could regard them as suspicious. Reasonably, they wouldn't want to share with us advanced physics that could give us the tools to annihilate ourselves or them. What about religion? If extraterrestrials have studied us they know what the dominant religions of Earth preach. In Christian tradition God created men and angels but who crated the aliens? What would our theological leaders say about them? They anticipate the worst case scenario.